Back of the Head: Smallville 8x11 - "Legion"
SUPERMAN! CHLOE SULLIVAN (possessed by BRAINIAC!) LANA LANG! DOOMSDAY! THE LEGION (OF SUPERHEROES): SATURN GIRL! LIGHTNING LAD! COSMIC BOY! Green Arrow, Tess Mercer, Lois Lane, and Jimmy Olsen sat out the episode but the latter two were named dropped by the Legionnaires. Wow, this was pure giddy DC Comics goodness on television. The geek references were out of this world. The Legion were from the 31st century, wore Legion flight rings, Smallville-esque gear perfectly invoking their classic costumes, name dropped Brainiac 5 and the names of their homeworlds, and had all their powers were not just intact but used liberally (including a nifty bio-electric magnetic pulse when Cosmic Boy and Lightning Lad combined their powers). 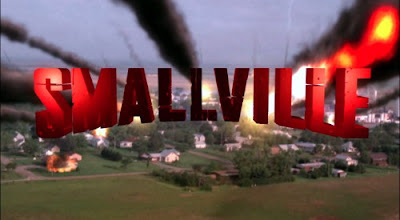 Best of all was the reveal that their "memories" of Superman's history don't jive at all with what they saw when they arrived in Smallville. "You come to be known as Su--"
After seeing Clark running at Superspeed: "What's with the ground transpo? Why aren't you flying?" Later: "No glasses, no tights, no flights, are you sure we have the right guy?" The Legionnaires point out that their history records Superman, Lois Lane, Lana Lang, Jimmy Olsen, but they've never heard of Chloe Sullivan! Lots of amusing spectulation of why that is, including several fanboy theories that have been floated through the years. Of course, Clark schools them on heroism, teaches them that heroes "don't kill - ever!" and even without the cape and tights, he's the Superman they remember from history. Chloe was saved from Brainiac and is back to normal, no longer super-intelligent from the Kryptonian brain boost. Clark gets a Legion flight ring as a souvenier from his new future pals, programmed for "time travel and not flying". Clark will have to learn to fly "on his own schedule." Just a lot of fun. A big love letter to DC comics fans.